Henry Ford’s much paraphrased remark from 1909, “You can have any colour as long as it’s black”, may have worked back then, but the savvy car buyer of the 1960s had colour expectations that Ford couldn’t have comprehended. Jensen Motors stepped up to the wire, and gave customers colours of the moment, but how did the company choose a range of colours. Was it some game of chance. A part of the agenda for all car manufacturers, was to stay ahead of the game when it came to the fickle world of colour, and Jensen Motors were no exception. Colours were put forward by the paint suppliers. Every few months a representative from the various paint companies, i.e. I.C.I & Carrs, would visit the Jensen factory to put forward new colours for Jensen Motor’s standard range. Tony Marshall, Export Manager, and later Sales Manager at Jensen Motors, believes it is most likely that Richard Graves, the Marketing Director, would have gone through the colours with them. Every Monday, there was the so-called ‘Monday Management Meeting’. These meetings were mostly headed by Richard Graves, and any matters relating to car colour, would be brought up for discussion at these meetings. This would generally take place after a visit from the paint supplier. Such discussions would relate to which standard colours were to be deleted from the range, and which new colours included. Additionally, it was common practise with car manufacturers to rename colours they were including within their range, so the renaming process would also take place at these meetings. Outside of the paint suppliers, both distributors, and customers would also provide input about paint colours. Indeed, Pat Follett, the Managing Director of Charles Follett, is known to have put forward paint colour proposals, on one occasion nearly causing friction with a customer. 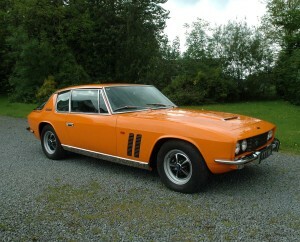 Clover didn’t realise, but both Charles Follett, and Jensen Motors, liked the ‘mango’ colour. In fact Jensen Motors added the colour to their range in 1970, even using the ‘mango’ name. Two further Jensen FF cars were sprayed in mango, along with a handful of Interceptors. Clover never did realise his ‘unique’ colour formulation had been added to the Jensen range until the matter was discussed with the author in 2016. When the completed Jensen was transported down to Charles Follett to be made ready for collection by the customer, Patt Follett took a liking to the unique magenta colour. He contacted Jensen Motors asking for a demonstrator car to be painted in the same magenta colour. Somehow, Harry Brown heard about this, and was extremely displeased. An abrupt and formal letter was sent to Patt Follett, stating in no uncertain terms, “you use my magenta colour, and I’ll never buy another car from you again”. Follett cancelled the order for a demonstrator in magenta. Marshall remembers that a variety of unusual objects would sometimes be sent to the factory, with the customer stating they wanted their car painted that colour. 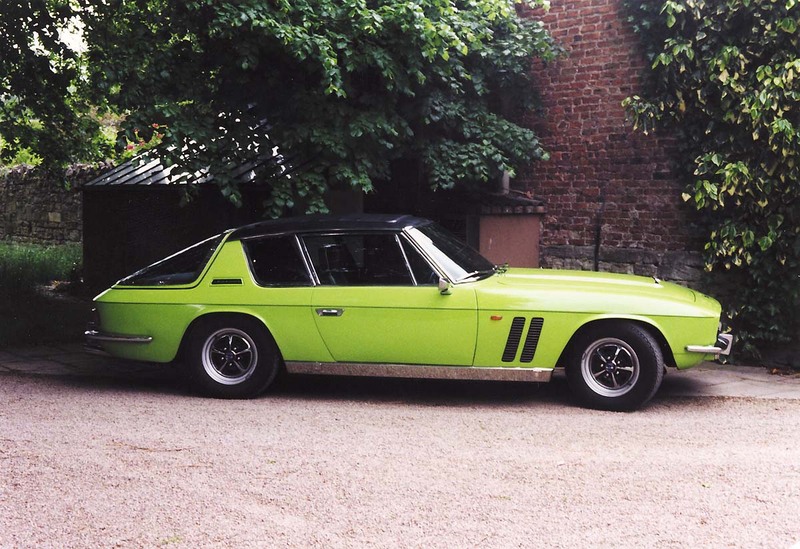 On one occasion, a customer sent a vivid green broom to Jensen Motors. Marshall contacted the paint suppliers, and the closest match was named, Jewelescence Poly Green. Jensen Interceptor, 115/2723 was duly painted in Jewelescence Poly Green for their customer. 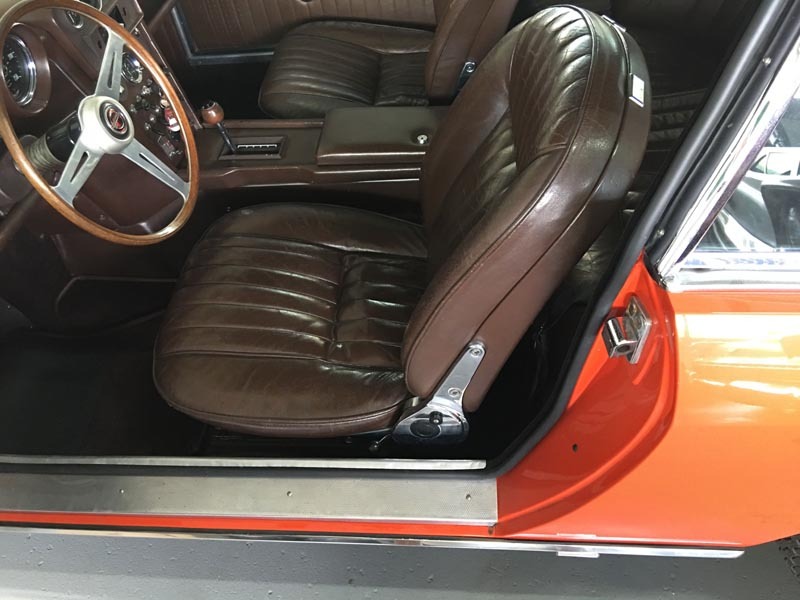 117/3139 finished in tangerine paint with mocha leather trim. Although it didn’t happen often, occasionally a car would be built up as a show car or demonstrator, with a colour choice decided by factory management. Typically, the likes of Graves, Powell, and Marshall would make the decision about colour schemes, both exterior and interior. Marshall recalls one such car, where he, and Powell came up with a quite unusual colour scheme. The car, a left-hand-drive Interceptor Mk.I (117/3139) was finished in tangerine, with a mocha leather trim. Certainly a brave choice of colour combination, which somehow worked. The car was taken over to Geneva where it acted as the demonstrator car, for those serious customers, who wanted to test drive an Interceptor before signing on the dotted line. 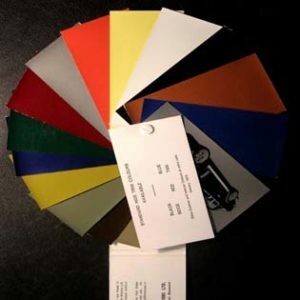 In 1969, Carl Duerr, Managing Director of Jensen Motors, asked Tony Marshall to undertake a Colour Survey. This was with the idea of putting together a range of new colours at the cutting-edge of fashion, ready for the new Mk.II version of the Interceptor and FF. Marshall had discussions with the major paint suppliers, and also had meetings with the British Colour Council, and the British Wool Secretariat. The outcome of these discussions led to a new range of dynamic colours for 1970, including colour icons such as pistachio, tangerine, and Clover’s mango. Marshall remembers purple in particular, which both the British Colour Council, and British Wool Secretariat recommended as becoming the new ‘in’ colour. Jensen Motors picked a purple colour, naming it cassis. The same paint colour was also used by Ford under the name, aubergine. One customer who was obviously ahead of the ‘game’, when it came to the matter of colour, was the drummer with The Jimi Hendrix Experience, Mitch Mitchell. He ordered an FF in 1969, wishing to have his car sprayed in a metallic purple paint. ACKNOWLEDGEMENTS: Our thanks to Tony Marshall, Ron Clover and Jan Isnenghi in the preparation of this article. ADDITIONAL INFORMATION: If you have any additional information relating to this article, please contact us at archive@jensenmuseum.org, or telephone +1694-781354.